Henry Wadsworth Longfellow never visited Minnesota, but his epic poem The Song of Hiawatha immortalized the Minnesota forests, prairies, and waters he saw only in his imagination. Longfellow began Hiawatha on June 25, 1854, he completed it on March 29, 1855, and it was published November 10, 1855. This poem could be revelatory of the best and worst aspects of pop culture…even if it was popular 160 years ago. A cynical synopsis? A man who never visited Minnesota or lived with the Ojibwe whose language he borrowed, wrote a pop lyric that morphed and mutated their culture with the East Coast Iroquois to the tune of the “Kalevela” of Finland?! Of course it became a smash hit, and the listeners accepted it as the truth! I’m not a cynic, Jesus. So today I wish to focus on that which gives life in this poem by Longfellow. I want to practice seeing the potential in historical works, rather than judging their limitations according to the standards of the present. Longfellow sought to learn real Indian languages, and wasn’t afraid to interact with real Indians. He invited Kahge-ga-gah-bowh, an Ojibwe Chief, to his home, and took the time to meet Blackhawk, Sac, and Fox Indians in Boston. If the poet saw a connection between tribes of the East Coast of North America with those of the Midwest, can we forgive him? Artists are allowed to make connections where others do not see them. We can find fault in their “improper” labeling of a small branch of a larger concept, and stubbornly miss their heart. As a drummer and percussionist, I seek to learn each new ethnic music from the ground up with great respect for its traditions. However, there is new life in breaking the rules, once one knows them. If one hears a connection between Celtic music and samba, then merging them into a new style is natural. “The Song of Hiawatha was written in trochaic tetrameter, the same meter as Kalevala, the Finnish epic compiled by Elias Lönnrot from fragments of folk poetry. Longfellow had learned some of the Finnish language while spending a summer in Sweden in 1835.” Calhoun, Charles C. (2004). Longfellow: A Rediscovered Life. Boston: Beacon Press. 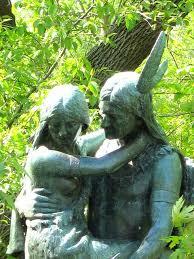 Father, will You bless Longfellow, Kahnge-ga-gah-bowh, and each Indian who shared his story? Will You continue to bless those who reach out to know a culture very different than their own? Will You honor those who see Your unyielding imagination expressed through all the families of nations? Thank You for Longfellow’s example that we can create beauty beyond the confining aspects of our culture. Show us ways to “include, but not be limited to” the legalism of our traditions. Thank You, First Poet, for drawing the romance from hearts of stone! Thank You for the possibility of fusing peoples together when living under grace! May we never tire of creating, merging, or reaching to describe Your beauty mirrored in the faces of fellow humans! With this heart and mind, will You bless our state?